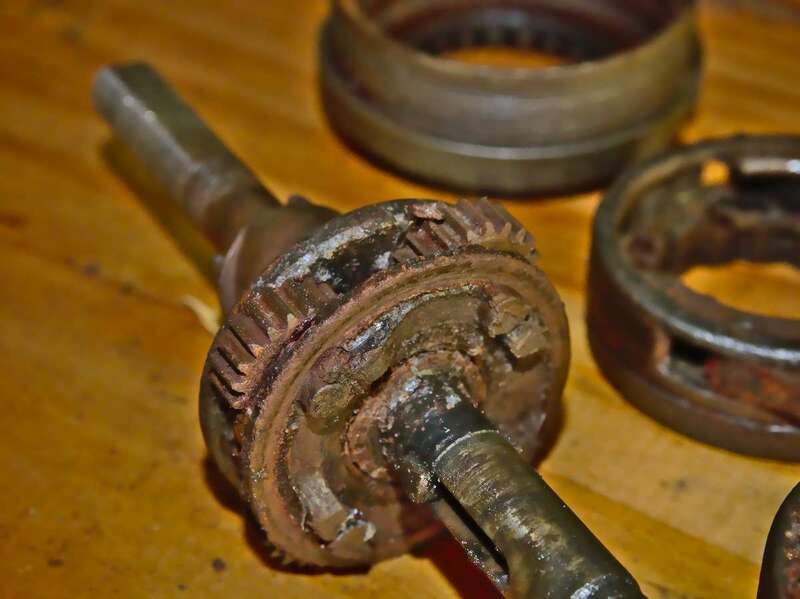 I already have more hub gears than I have bicycles to put them in, so I wasn’t all that enthusiastic about taking them. 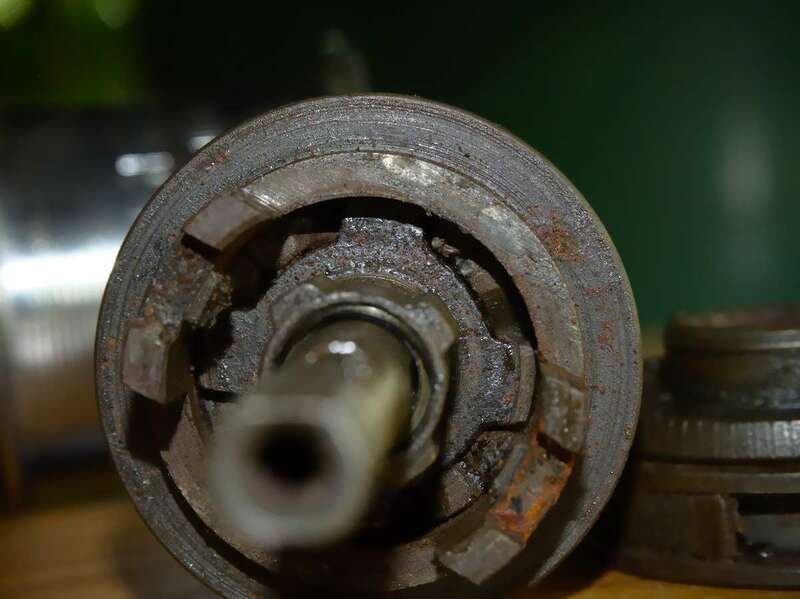 However, I noticed that one of the hubs was seized up, so I decided it could be interesting to pull it apart just to see what was wrong, and to attempt to restore it to working order. But mainly just to see how it works, since I don’t have any use for either of these hubs, and (being completely satisfied with cantilever brakes) no motivation to use a coaster brake hub. 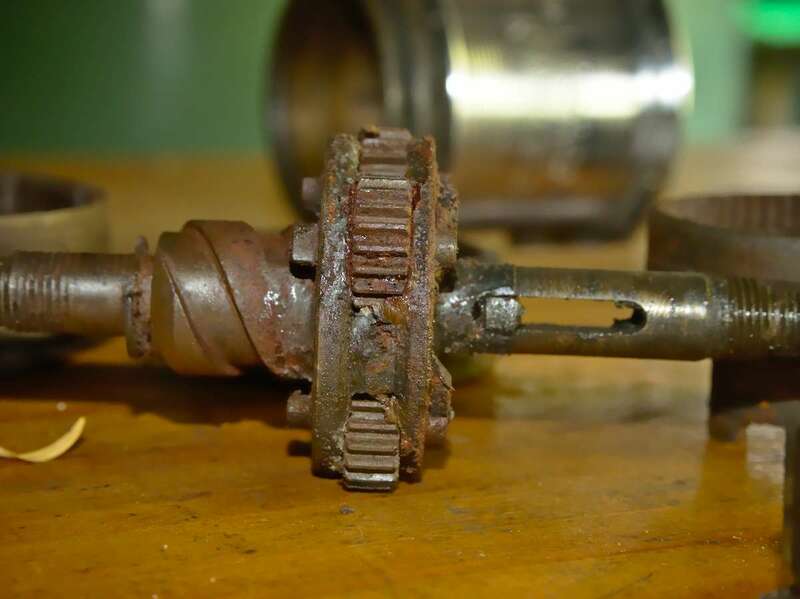 Sheldon Brown has summarised the history of Sturmey-Archer’s coaster brake hubs: http://www.sheldonbrown.com/sturmey-archer/tcw.html. 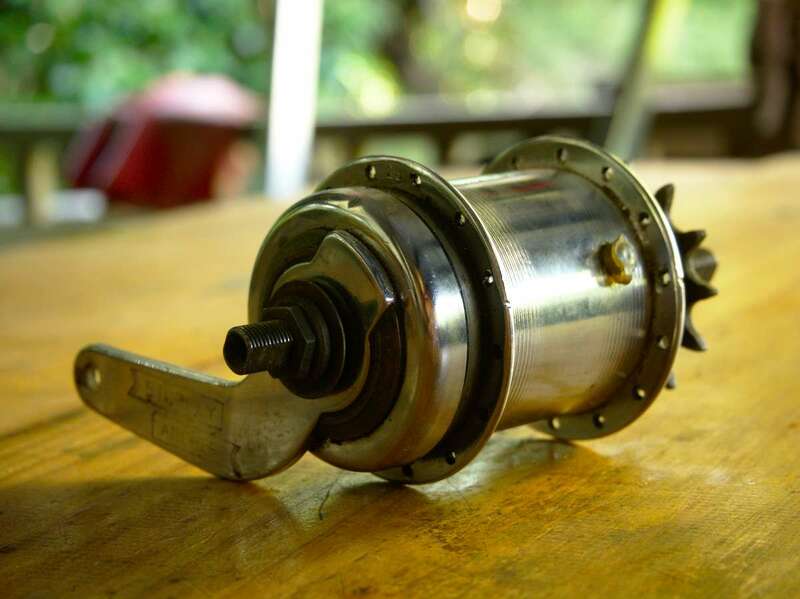 The first coaster brake they introduced was the TCW hub starting in 1952. 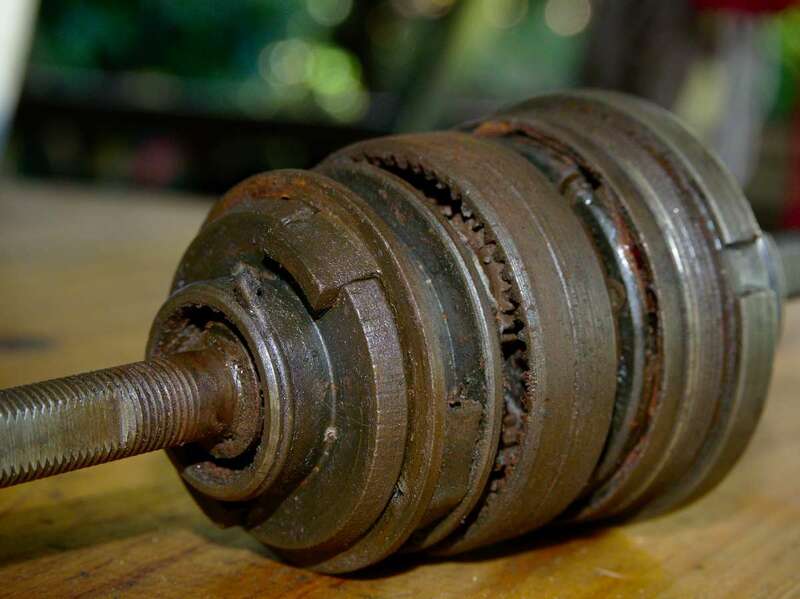 These had the well know drawback that the braking power depended on what gear was selected. 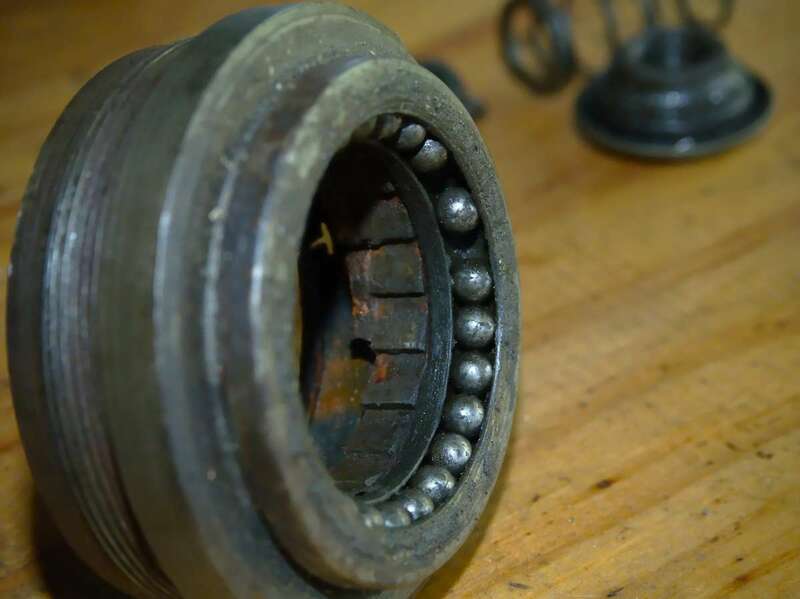 When the hub was in top gear, the brake would be weaker than in low or middle gears (low and middle had the same braking performance), which was ironic since you would be going faster when in top gear. Secondly the brakes wouldn’t work at all if the hub was accidentally in it’s neutral position between middle and high gear, but I think this is less of a concern: any coaster brake won’t work at all if the chain comes off too. 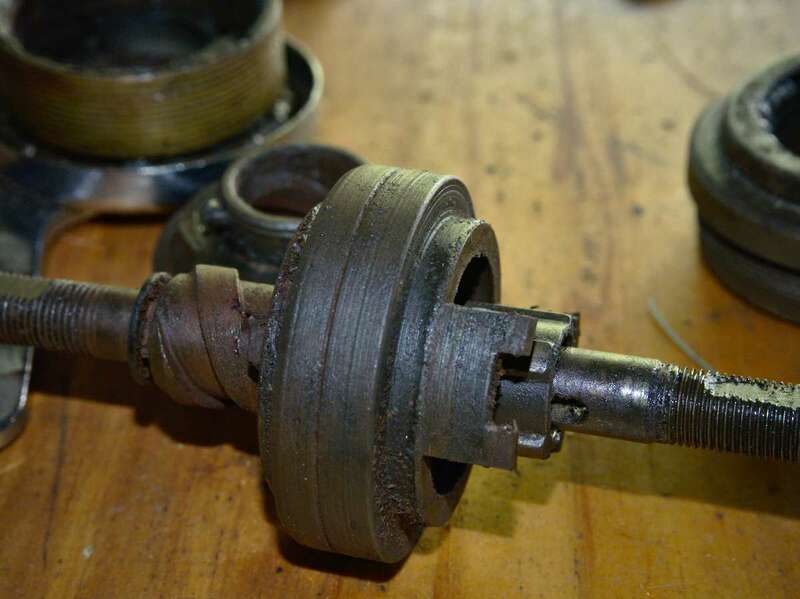 The S3C hub was introduced in 1970, and addressed the first problem of the braking power varying depending on which gear was selected. This was done by adding a set of backwards facing pawls in the driver, so that when you pedaled backwards, the pawls would catch and turn the gear ring backwards which turned the planet carrier backwards which activated the brake. This sequence was used for braking regardless of the position of the clutch (indeed even if the main clutch was in the neutral position which was still present in the S3C hub). As it happens, the two hubs that John had were different models: one was a TCW hub made in August 1955 while the other was an S3C hub from April 1972. The hub that had seized up was the S3C; a stroke of irony since it would be the better hub to use if I was so inclined. The exterior looked clean, but the fact that it was seized up solid indicated something was badly wrong inside. Here you can see one of the cones that activate the coaster brake. When you pedal backwards, this is turned on a helical groove, which presses the cone towards the other brake cone. 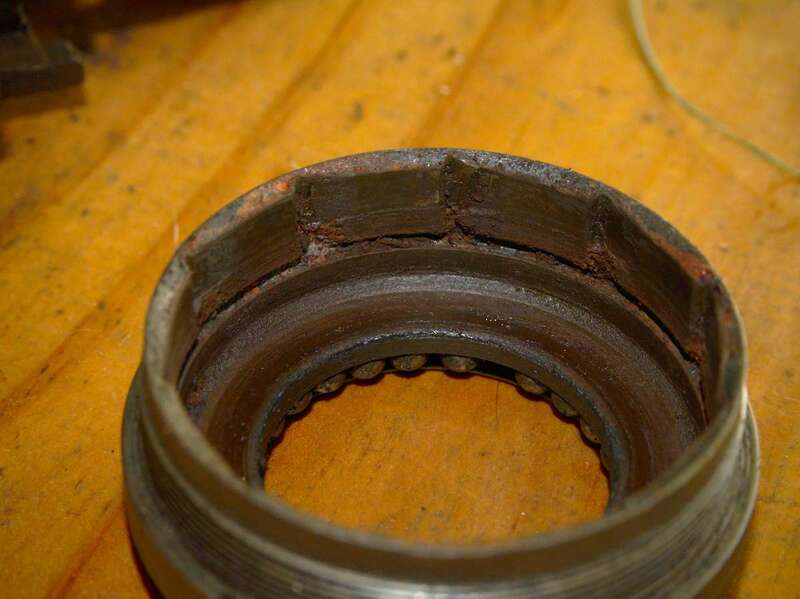 Here you can see the second brake cone, with the hub bearings around it. Note that this cone doesn’t move. The driver. The backwards facing pawls activate the coaster brake, which means that braking performance is the same no matter what gear the hub is in. 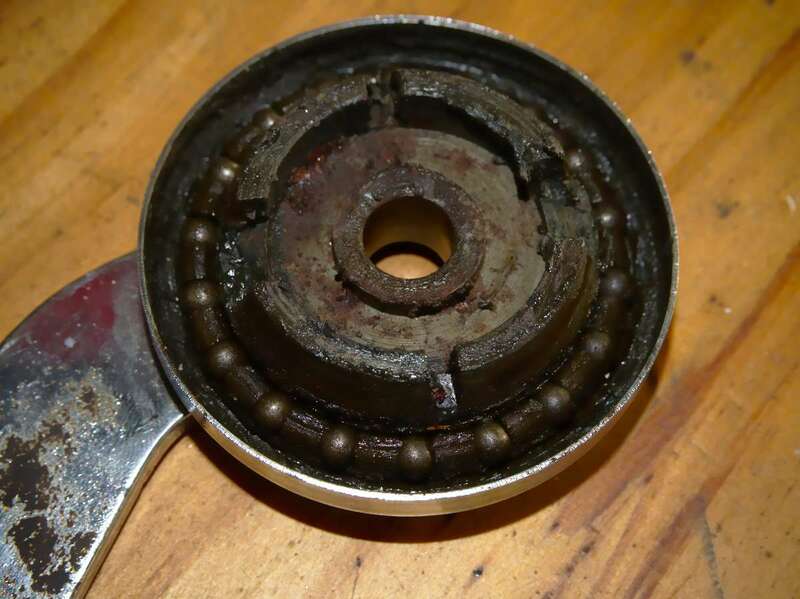 Later hubs weren’t like that, and the coaster brake would be more powerful in some gears (and the brake also had a “neutral” between second & third gears). The main clutch. Plenty of rust and dirt. 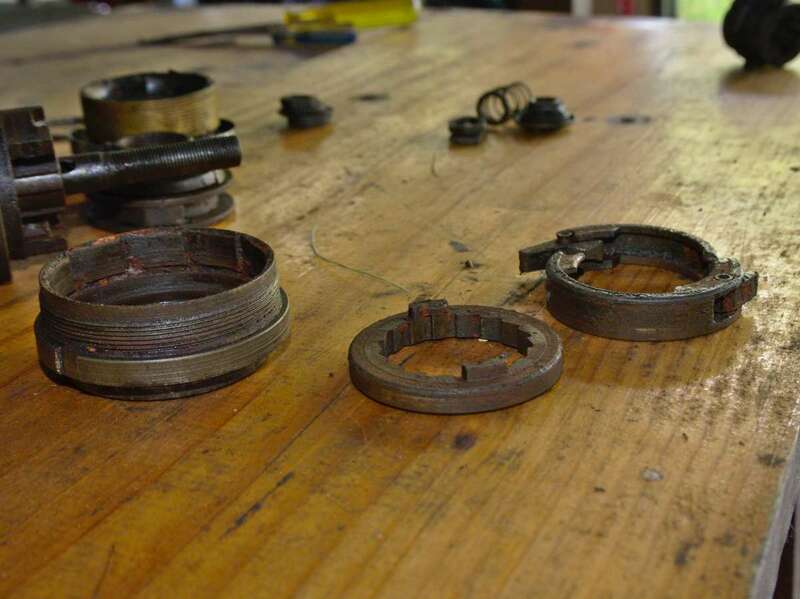 The spiral on the right drives the coaster brake, as seen in an earlier picture. 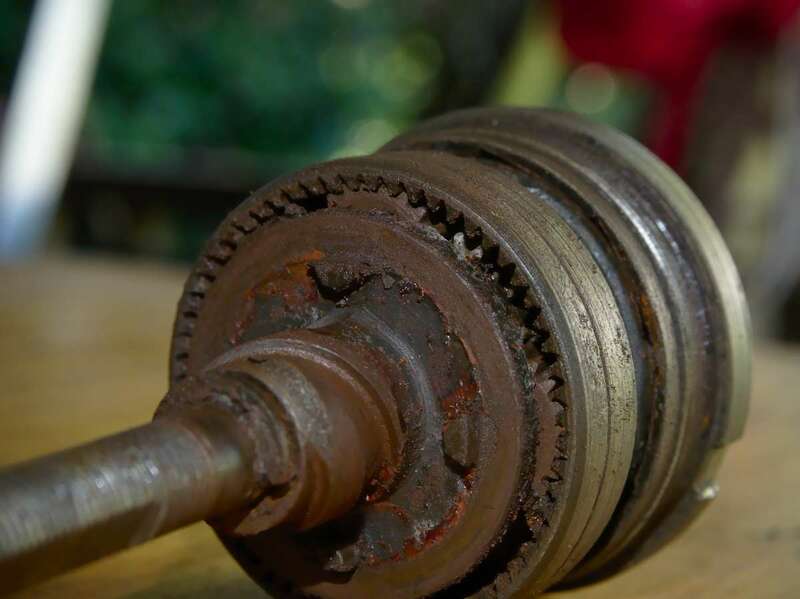 As the gear ring is turned backwards by the hub driver, the planet cage is turned by the gears. The helix is machined as part of the planet cage. 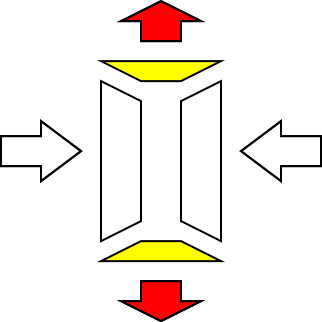 The pawls on the driver turn this ring when you backpedal, and that in turn drives the gear ring backwards. 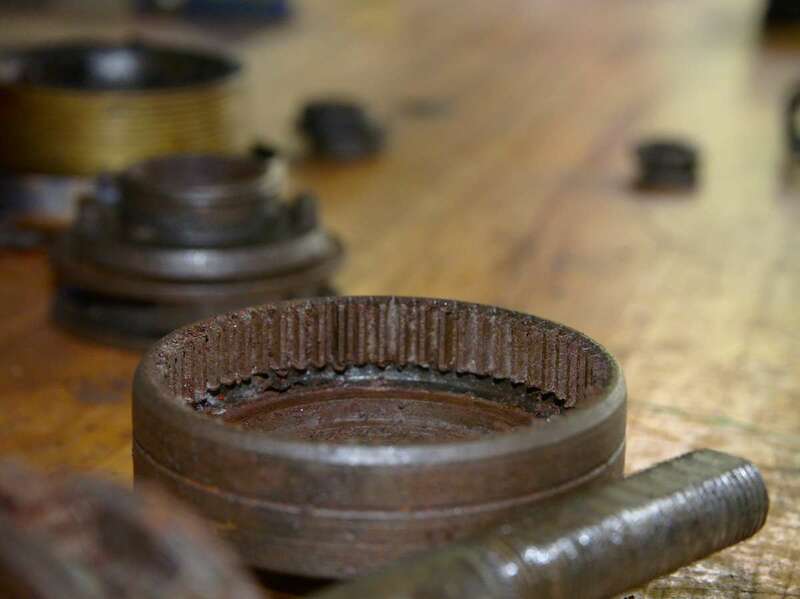 Muddy gear teeth in the ring gear. At this point the planet cage wouldn’t turn around the axle. Seized up completely with dirt. This ended up being more a post-mortem than an overhaul, and a cautionary tail on the importance of proper maintenance. To begin with, I removed the left hand locknut and washers and the brake arm and cone. All of the nuts were only finger tight to begin with (I assume that someone else had opened it up before I got it) so I didn’t need to use any tools for this. 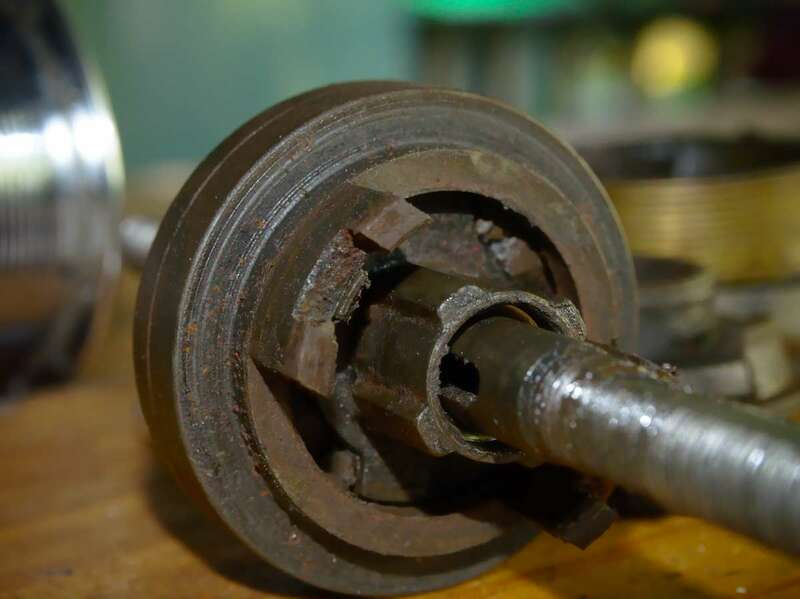 When they’re tight it helps to hold the axle in a vice while you unscrew the locknuts. The scale of the problem really started to show once I got the internal assembly out of the hub shell. Everything was coated in a brown earthy substance that seemed a lot like clay or mud (and indeed, it may have been partially composed of soil). 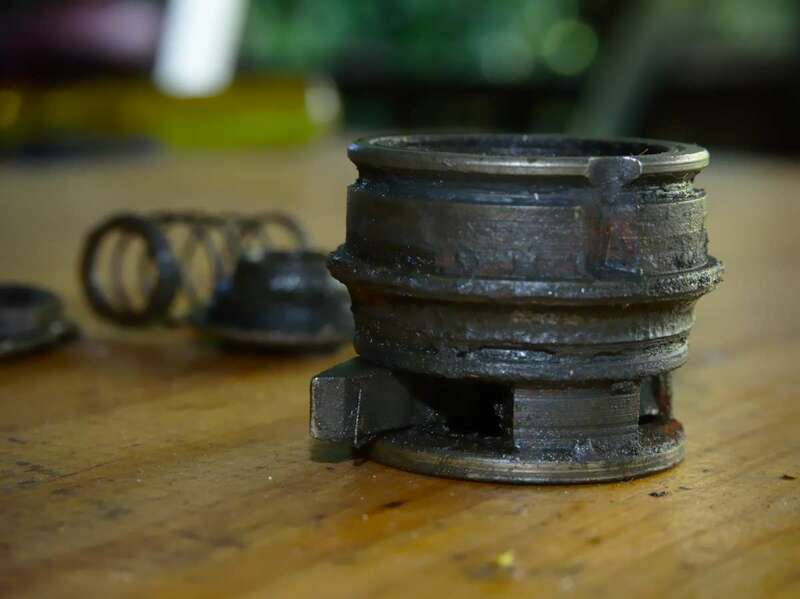 I think this substance consisted primarily of old grease or oil that had thickened with age, as well as a good amount of rust and perhaps a bit of water in there as well. 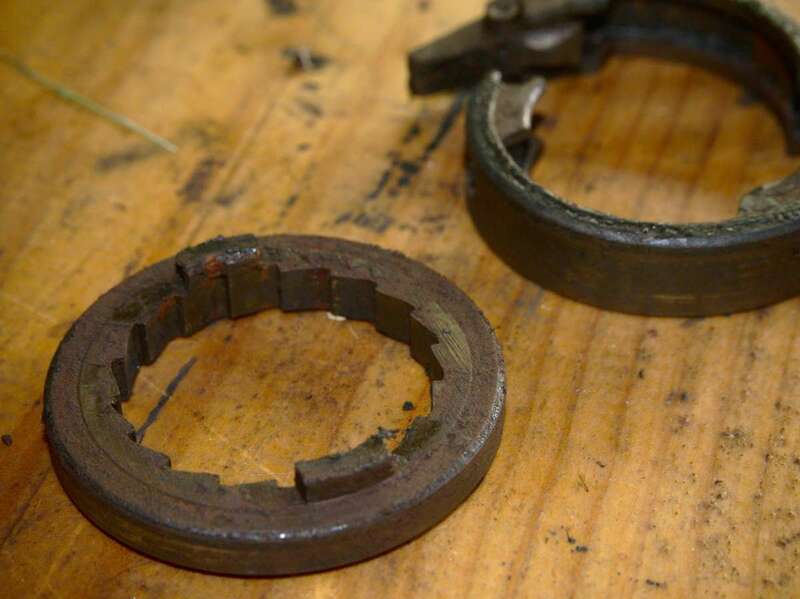 The right hand ratchet ring would turn with difficulty, but the gearset was jammed solid. Low gear wouldn’t have worked too well, as the low gear pawls were so gunked up that they didn’t extend under the force of their springs. 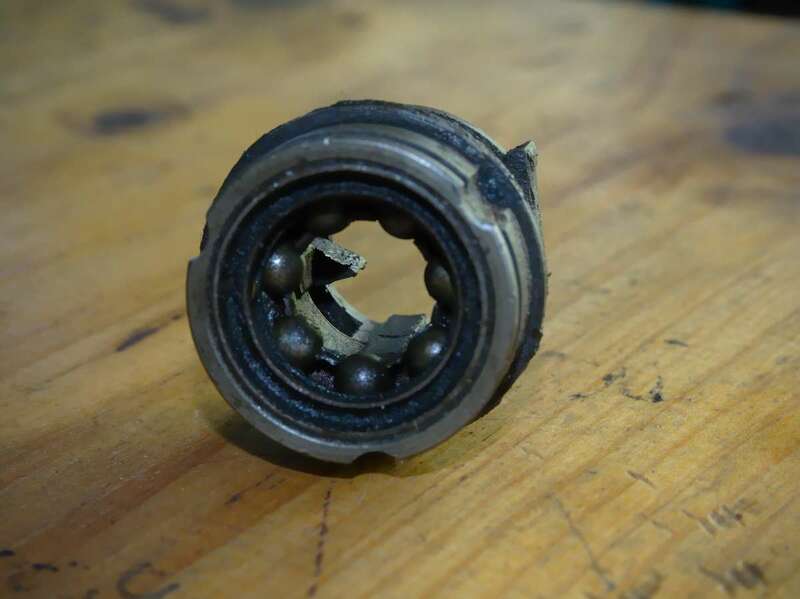 When I removed the ball ring I found a further problem that presents a major hurdle to any restoration of this hub. 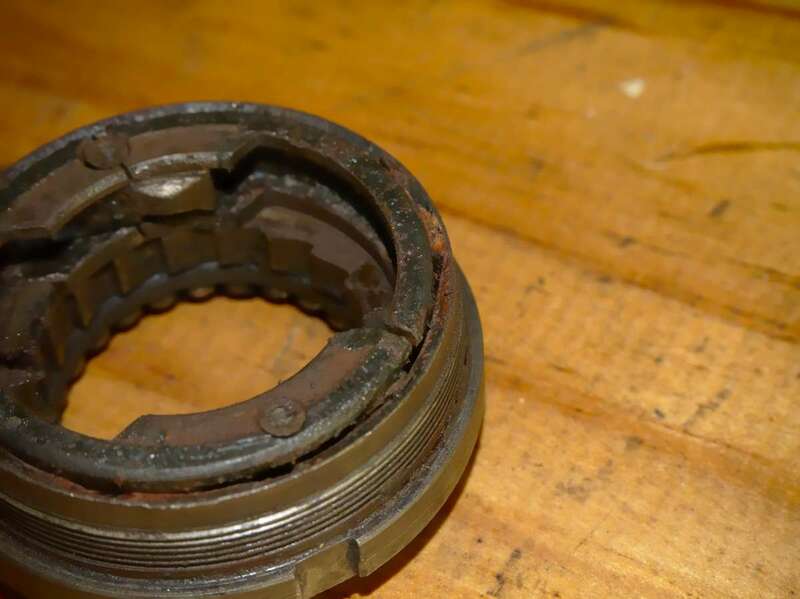 The pawls that transfer power from the gear ring to the hub shell are in a separate carrier unit in this hub, and that carrier had cracked in half across one of the pawl pins. The S3C is now well and truly out of production, so there are no replacement parts available off the shelf. So this means that fully restoring this hub would require me to fabricate the replacement part, or scavenge it from another S3C hub. 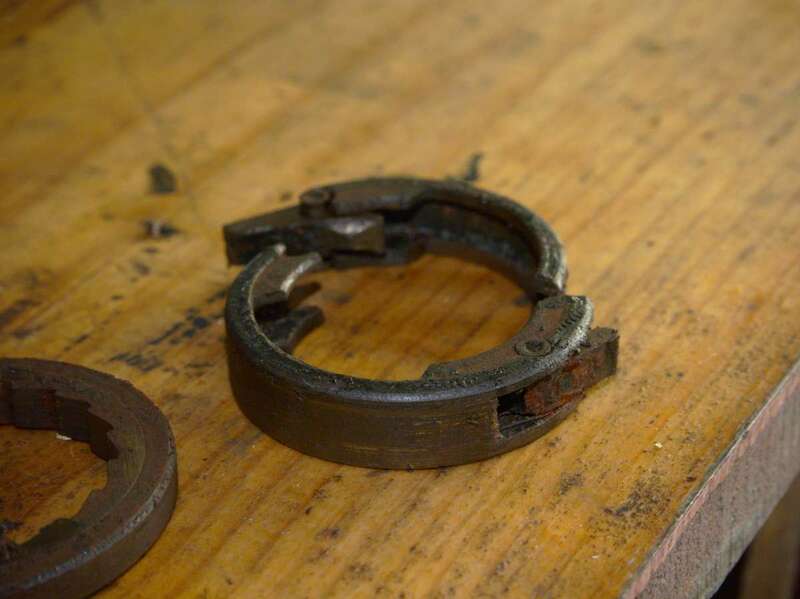 I’m going to go with option three, which is to put the hub back together and put it on a shelf; a future project. how do coaster brakes work? Until pulling this hub apart, I had zero knowledge on how coaster brakes work. I haven’t used one since I was about 10 years old, and my main recollection from that time is that I managed to develop the skill of jamming the brake on to create impressively long skid marks. They consist of a circular band with a gap in it so that it can be spread out. There are then two cones on either side of the brake band. As the cones are forced together, they press outwards on the brake band, pressing it against the hub shell and slowing you down. 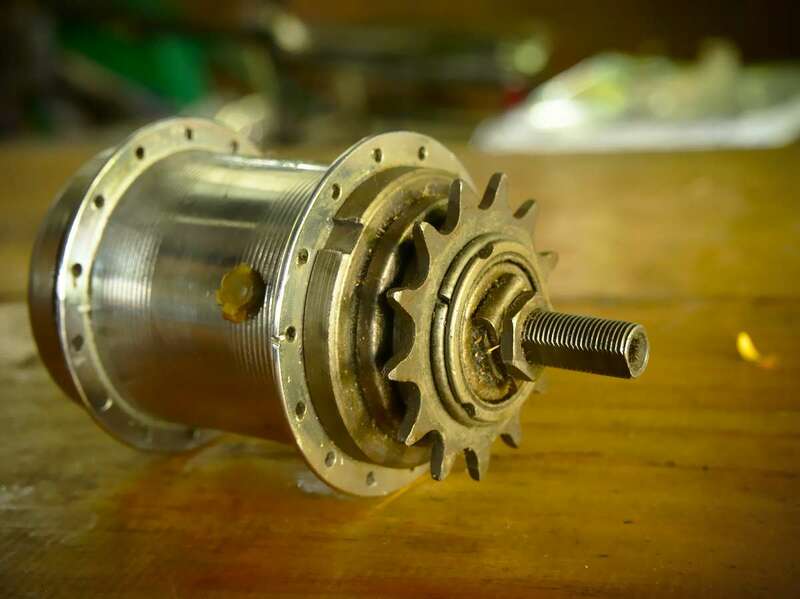 There is a helical device that is driven by the sprocket which forces one cone towards the other when you pedal backwards. Cross section view. The brake band is show in yellow, and the cones in white on either side. As the cones are forced together, they press outwards on the brake band, creating friction. I put most of the parts (except the broken pawl carrier) into a kerosene bath to clean off the gunk. There is still some corrosion, so I might do an experimental Coke Zero bath at some stage to see how well it really performs as a rust removal product. I even managed to unbind the planet carrier unit which was particularly gunked up in the narrow space around the axle. Removing the planet carrier requires undoing a fairly big Jesus clip. I’ve encountered these before, so I should have known better and covered it with a cloth or a bag while I pried it off with a screwdriver. One instant it was there, the next… gone. I heard a ping as it ricocheted off our water tank, and noticed some movement on the ground about 5 meters to the left of that, near the wall of the house. God knows where the wretched thing’s gone; I looked all over the ground and couldn’t find it. The speed it was traveling (I think 600 kph is a reasonable estimate, probably more though) it could well be in a different suburb. 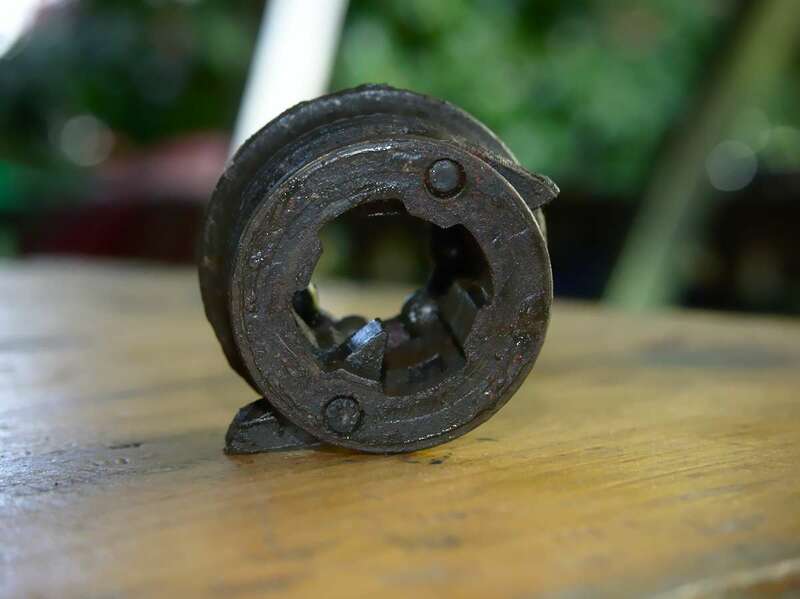 So, after saying “Jesus” I put the hub back together, minus a fair bit of gunk and one circlip. Fortunately the circlip didn’t seem to be a critical component, just useful to keep the planet carrier from falling off when the assembly is held vertically in a vice. Some day I’ll probably stumble across the missing circlip.